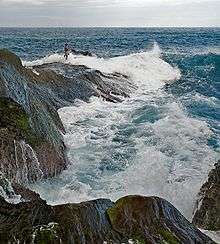 Rock fishing is fishing from rocky outcrops into the sea. It is a popular pastime in Australia and New Zealand. It can be a dangerous pastime and claims many lives each year, although this may improve as more fishermen are beginning to wear life jackets. Rock fishing can be done with a rod and reel and line, or a line only. Both ground and surface fishing are generally successful methods. Rock fishing can be done both with artificial lures and natural bait. While bottom fishing typically relies on natural bait, both natural bait and artificial lures are used in different forms of surface rock fishing. Some fishers who are rock fishing use an umbrella rig in spring, and use bait fish, such as perch and bluegill, in summer and autumn (the fall). Using an umbrella rig is a method of trolling. Typically, an umbrella rig consists of four plastic neon green lures with a lead dragging behind. An additional lure is attached to the lead. Only the lure behind the lead will have hooks attached because this lure can appear to a stalking fish as the wounded or sick laggard in a school, making it a more likely target. Another method of rock fishing is using bait fish. The bait fish may be bought from a store, or the angler can catch them himself. Bait fish can be used either whole or cut up into pieces. The size and type of bait fish used will vary depending what species is being targeted. Problems may arise from the fact that sea bottom areas close to a rocky water's edge often consist of jagged rocks, which can cause a sinker rig to become snagged beyond recovery and thus be lost. Conversely, surface fishing with a float or buoy is often made difficult by the fact that rocky shore areas can have strong currents, in which light floats in particular can be carried away quickly from a desired area. Spin fishing as a form of surface fishing can allow more control over a lure or bait in these conditions. Rock Angling as the name suggests usually entails the angler fishing from a rock ledge or outcrop on the shore. This will usually allow the angler access to deeper water than from the beach, which usually means more fish. 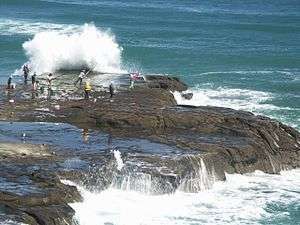 Fishing from rock ledges and outcrops can be very dangerous and should never be done alone, as anglers each year are swept off rocks by the power of the sea and some of these are swept to their deaths. An angler rock fishing will usually use a rod of between 10 and 11 feet when fishing from rocks although the full Beach Casters of 12 to 14 feet may be used when distance casting is required or a stiff rod is required due to rough ground. It is usual that only short casting is required from rocks to catch fish as they tend to be close in trying to feed of crabs and other animals. 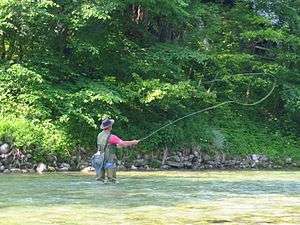 Again the angler may use a fixed spool reel or a multiplier reel loaded with line from as little as 8 pound (float fishing) to 30 pounds over rough ground. When fishing from rocks several different methods can be used such as bait fishing, spinning/plugging and float fishing. Bait fishing will be much the same as from the beach but the most common bait would now be peeler crab and hard back crab. Spinning/plugging involves casting an artificial lure or plug and retrieving it to induce a fish to 'take' attack the lure or plug. Whilst float fishing is simply suspending a bait usually a rag worm, sand eel of prawn below a float. The species of fish targeted will be the same as from the beach but will include species such as Ballan Wrasse. Species varie from coast to coast, but the main species from rock marks are conger eels, various species of ray, tope, cod, bass and bullhuss. A rotten bottom system is commonly used among professional anglers looking to cut down on tackle losses due to rocky snags. ↑ Preventing coastal drownings in Australia National Coastal Safety Report 2009.